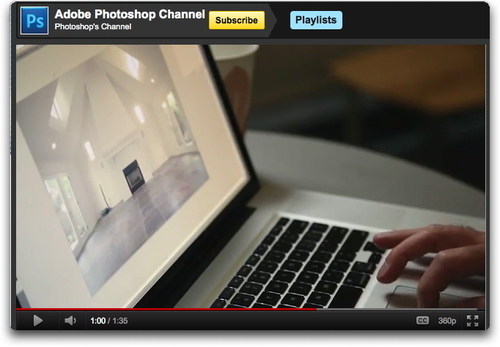 Adobe has created a CS5 Hidden Gems channel, hosted by Bryan O'Neil Hughes. Via a series of short videos, Bryan demonstrates helpful, interesting techniques for Photoshop. You can learn how to straighten images with ease, restore old photographs, remove a wire, and more. Plus, Bryan will be adding more hidden gems to this channel, so you might want to subscribe to it. "Sharing a View" by Derrick Story. Click on image for larger version. Who says that man and animal have different sensibilities? In this case, everyone seems to be enjoying a late morning view of the ocean waves. Captured with a Canon 60D, 15-85mm E-FS zoom, polarizer, and processed in Aperture 3 with Silver Efex Pro. 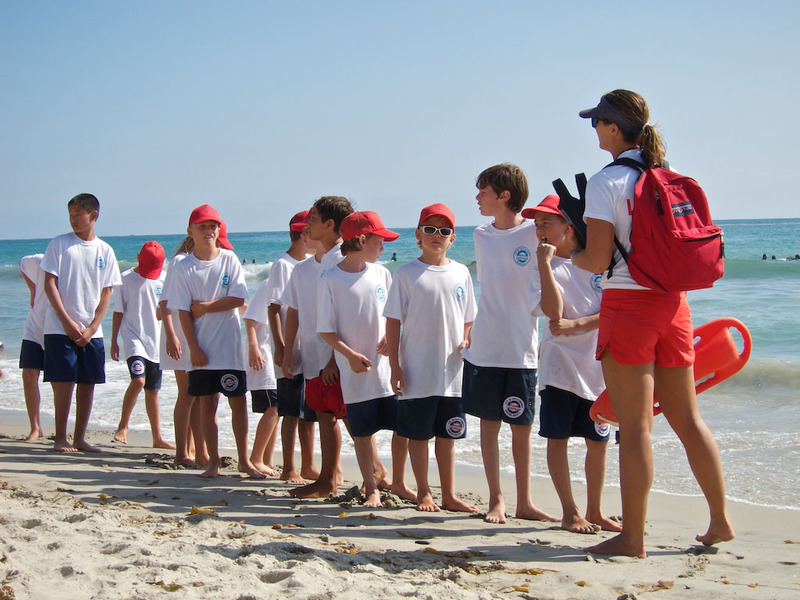 "Junior Lifeguards" at San Clemente Beach, CA. Photo by Derrick Story. Click on image for larger version. These junior lifeguards are lining up for a run on the beach in San Clemente, CA. I love the kid with the shades near the front of the pack. 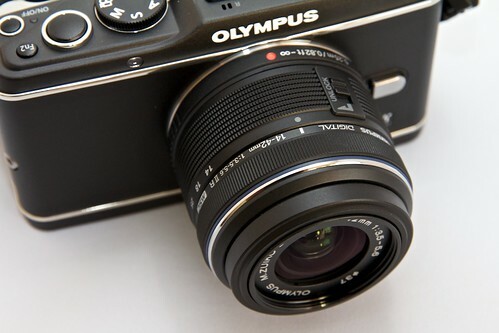 Olympus announced today that the Olympus E-PL3 will be available in September 2011 for $699.99 (with redesigned 14-42mm zoom lens). They also add a new accessory to its PEN Micro Four Thirds system family today with the introduction of the compact VF-3 Electronic Viewfinder. Priced at $179.99, the VF-3 attaches to any Olympus PEN model with an accessory port, as well as the Olympus XZ-1, for eye-level convenience. 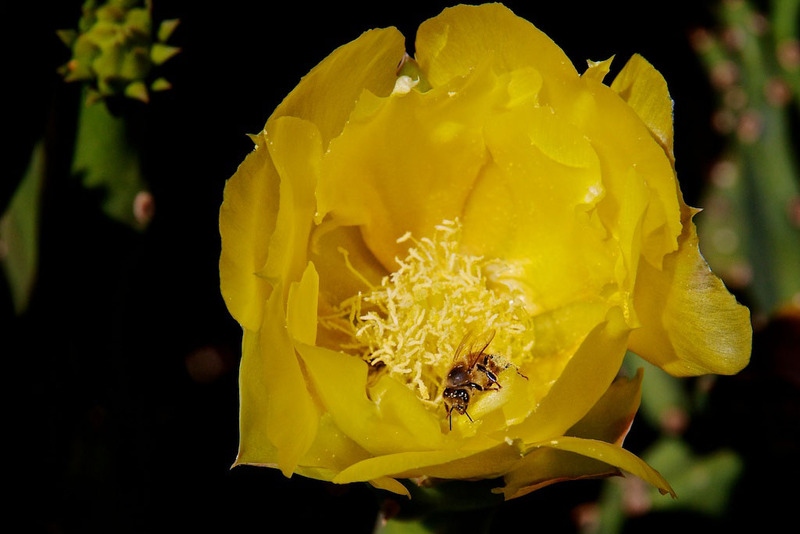 Bee in Cactus Flower: Mission San Juan Capistrano. Photo by Derrick Story. Click on image for larger version. This bee climbed into the cactus flower and disappeared in a pool of pollen. After a few minutes, he emerged, seemingly intoxicated. 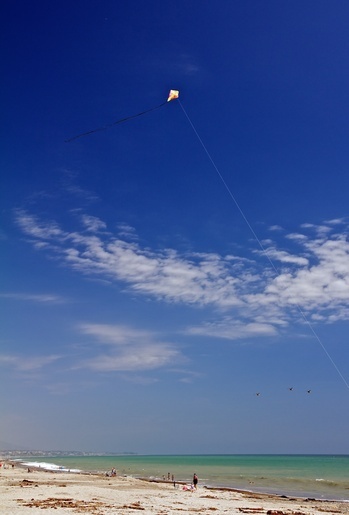 I captured him in his euphoric state with a Canon 60D, 15-85mm E-FS zoom, and a polarizer filter. I've always used external hard drives to store my Aperture 3 Vaults. And even though I work with a referenced library these days instead of a managed library, I still use the vault to back up my image adjustments, ratings, and metadata. If my computer ever fails, I want to be able to restore my work as well as my master files. But as I experimented more with personal cloud computing, I started thinking that it would be nice to have a copy of my vault on one of those network drives that has RAID1 mirroring. So I tried it. On my local area network, I selected the Iomega ix2 storage drive that contained two 2TB hard drives that were set up to mirror one another. I opened Aperture and selected "Add Vault" from the gear menu at the bottom of the Library pane. In the dialog box that followed, I was able to choose the Iomega ix2 from the "Shared" drives. 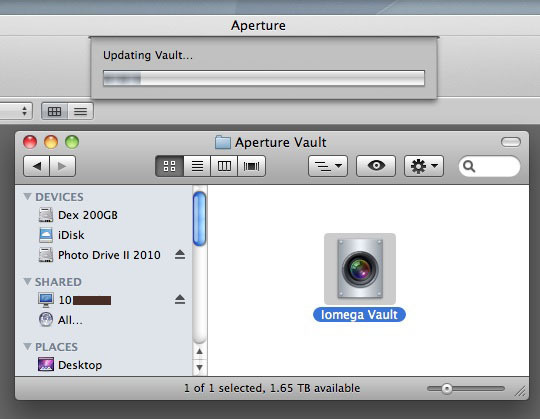 I initiated the process for creating a new Vault... and Aperture began backing up to it. Even though my master Raw files are not contained in the Aperture library, the back up of my previews and work is still about 50 GBs. The building of the Vault for this went slowly, taking overnight to complete the job. Subsequent updates to the Vault have gone much faster since Aperture uses incremental archiving -- it only backs up new data or data that has changed. It's still not as fast as a connected hard drive. But, I usually just work on other things during the few minutes it takes to refresh the Vault. With this new set-up, I find that I'm running the Vault more often because it's more convenient. I doubt that I'll ever try this over the Cloud, but over my local area network, all seems well. The third gallery of TDS Member Photo of the Day images is now complete and ready for viewing. 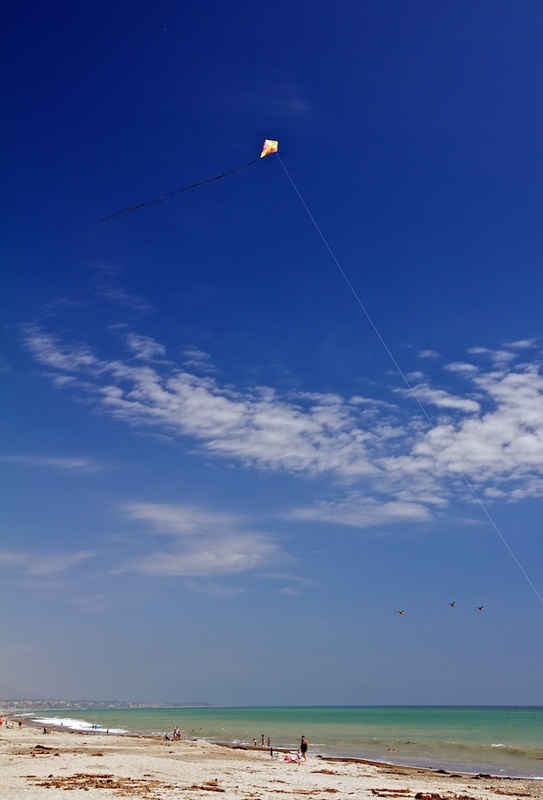 Each photo includes commentary by me discussing why I think the image is inspiring. Something new too... Flickr has added a Lightbox feature for viewing galleries. I highly recommend trying it for this one. You can let it autoplay, or click forward and backward manually. It's a stylish way to present these beautiful images. Featured photo, "An exercise in persistence" by TDS Member Lynn D. Rosentrater. Click on the image to learn more about Lynn and her work.